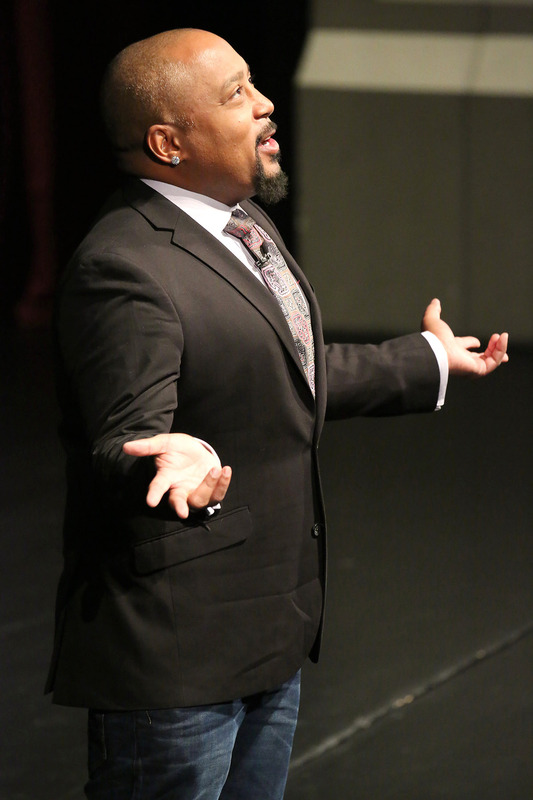 NOTE: A high resolution photo of Daymond John is available by emailing jeblackmon@fhsu.edu. HAYS, Kan. – People gathered in the lobby of Sheridan Hall at Fort Hays State University long before the start of Wednesday’s 7:30 p.m. presentation. They wanted to make sure they got a good seat in the Beach/Schmidt Performing Arts Center for Daymond John, the feature for the second annual Presidential Speaker Series. The series is an annual event designed to bring today’s top thought leaders to share their knowledge and expertise on national and world events with the Hays community. The series is funded by the Office of the President and the students of Fort Hays State University. Many of those attending, including FHSU students, are fans of Shark Tank, ABC's hit show featuring budding entrepreneurs, of which John was an original investor. Others attended the event because some of their professors encouraged them to do so. Whatever the reason, John entertained and inspired the crowd of about 600 while talking about leadership, innovation and entrepreneurship. John is the author of four acclaimed books. The most recent, “Rise and Grind,” released earlier this year, centers on examples of people who succeeded while overcoming the odds. He also consults through his branding company, Shark Branding. He told the story of being raised by a single mother and learning a lot by failure. He created FUBU, a hip-hop apparel company as a youngster. John turned the small company, started in his mom’s home, into one of the most iconic urban fashion brands in the world that netted $350 million at its peak. John, who never attended college, applauded FHSU students for getting an education. His presentation centered on five S.H.A.R.K. points that lead to success in business and in life: 1. Set a goal; 2. Homework; 3. Amore (love) what you do; 4. Remember that you are your brand; and 5. Keep swimming. Cenyeaa Williams, a graduate student from Kansas City, Mo., was impressed. Williams said she watches Shark Tank frequently and had been looking forward to John coming to FHSU but that her mother was even more excited. “Mom was considering making the four-hour trip from Kansas City,” Williams said. “She’s a huge Shark Tank fan. Yolandra Williams wasn’t able to attend after all, but her daughter said she would fill her in. About 50 students got the chance to visit with John earlier in the day during a question-and-answer session facilitated by Dr. David Snow, director of FHSU’s Center for Entrepreneurship. Several of those were members of CEO, Fort Hays State’s chapter of Collegiate Entrepreneurs Organization. Hays junior Taryn Rupp, a tourism and hospitality management major, said she had seen Shark Tank only a couple of times but decided to attend both sessions. In addition to being a member of the CEO, she also is a Peer Academic Leader for Everybody’s Business Learning Community.